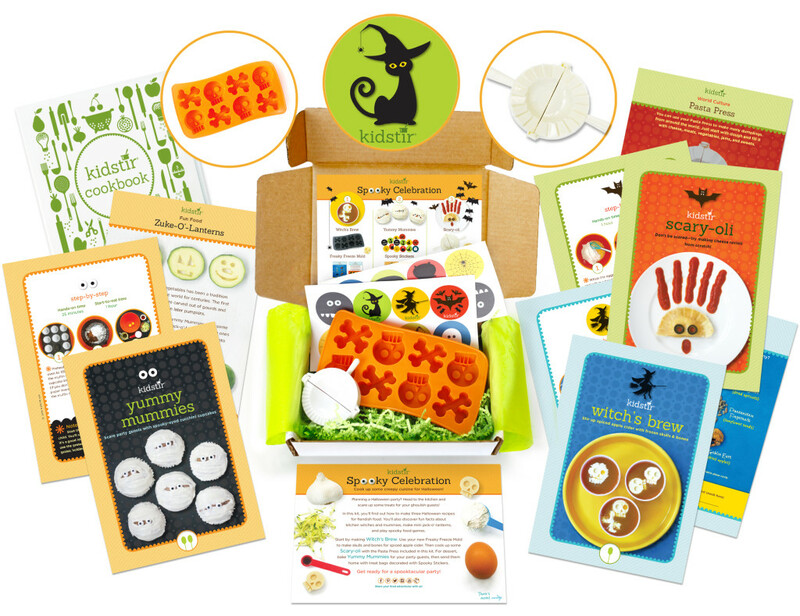 I’m so excited to introduce our October Kids cooking Spooky Celebration Kit! Fall is here, and everything is about to turn red, orange and spectacularly spooky! Halloween is one of my kids’ favorite holidays, and I love the opportunities it gives all of us to imagine, create, and socialize! Our October kit is all about celebrations big and small- whether it’s lunch for your family before you head out for your school’s Fall Festival or a bigger gathering for neighborhood kids on Trick or Treat night. I know you’re just dying to know what’s inside this wicked cool Kidstir kit, so let’s not wait a minute more! From quick and easy recipes to projects you can sink your teeth into, Spooky Celebrations will keep you entertained all month long! Witch’s Brew. Stir up spiced apple cider with frozen skulls and bones! This is such an easy and fun recipe for kids to make, they’ll be making it over and over. Just mix up a special mix of yumminess (awesome recipe in kit! ), freeze, and drop into a bowl or glass of apple cider. Frightfully fun! Yummy Mummies! I love cupcakes. Do you? But you know what makes me feel better about indulging in them? Adding in some fruit or veggies. I love tossing in bananas, carrots, or zucchini. It’s this last ingredient which adds flavor and nutrition to our yummy mummies. You’re going to devour them! Scary-oli! Okay this is just too cool. This month, we are going to help you teach your kids how to make home-made ravioli! My kids seriously thought that ravioli were “born like that” until I explained the fascinating process by which the dough is rolled, stuffed, folded and then boiled to make delicious pockets of pasta heaven. After you’ve got the ravioli made, scare them up with a little terrifying decor to add the final flair! This month’s tools and extras are more fun than ever! Spooky Stickers What kid doesn’t love stickers? Playing with them, sticking them, collecting them? Well our fun designs are great for all of the above, plus sharing in goodie bags full of treats for trick or treating buddies! p.s. Don’t forget to print and share this fun Halloween scavenger hunt with your friends too! Pasta Press This tool is so handy- whether it’s pressing ravioli to make Scary-oli, sealing empanadas, making home made wontons you can make a whole world of dumplings with this pasta press. Kids will absolutely love making little pockets of yumminess! So far we’ve just discussed the recipes and tools in the kit –don’t forget all the great foodie learning tucked into the kit: Food History Egyptian fun facts, Fun Foods vegetable carving traditions, Baker’s Secret cream cheese frosting, World Culture dumpling learnings, Secret Ingredient pasta varieties, Party Treat Magic Mix, Food Folklore kitchen witch craft. Mmmm…And then there are all the additional recipes and activities you can get to complement what’s in the box that you can find on our DIY page. Ready to have a spook-tactic month? 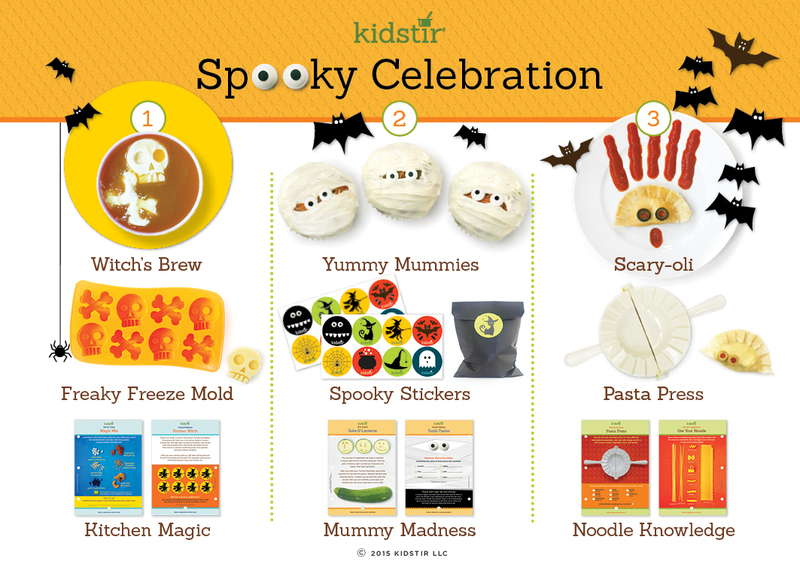 Tear open Spooky Celebrations and start cooking! Invite some friends, set out the goodies, and let the ghoulish fun begin! Share your fun times, tips and tricks, and learnings with us on Facebook, Instagram, Pinterest, and Twitter. We love your photos! Happy Halloween!